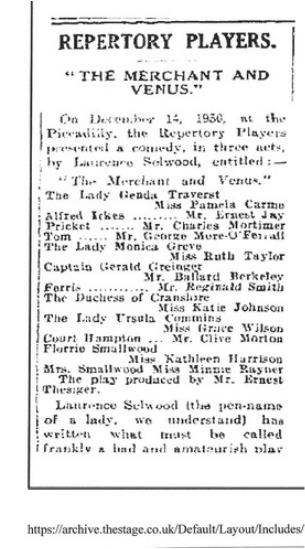 Charles Mortimer played Pricket in the "Merchant and Venus" at the Piccadilly Theatre, London, on 14 December, 1930. The play didn't seem to get decent revies, the Stage calling it "bad and amateurish". From The Era - Wednesday 17 December 1930. From The Era of 17 December, 1930. A Comedy in Three Acts, by Laurence Selwood. 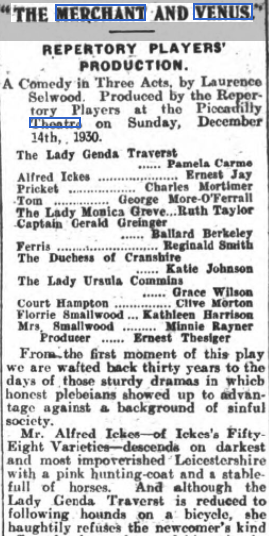 Produced by the Repertory Players the Piccadilly Theatre on Sunday, December 14th, 1930. From the first moment of this play we are wafted back thirty years to the days of those sturdy dramas in which honest plebeians showed up to advantage against a background of sinful society. Mr. Alfred Ickes’s - of Ickes's Fifty- Eight Varieties—descends on darkest and most impoverished Leicestershire with pink hunting-coat and a stable full of horses. And although the Lady Genda Traverst is reduced to following hounds on a bicycle, she haughtily refuses the newcomer’s kind offer of a loan of one of his animals. This is the beginning of act one, however, and in plays of this type we know that human relationships suffer quick and incomprehensible changes. By the end of the act, aristocracy has thawed to the extent of entering into , what is called “social partnership” with Croesus. 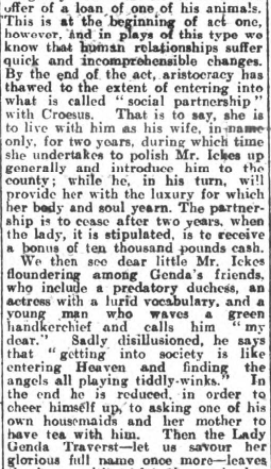 That is to say, she is to live with him as his wife, only, for two years, during which time she undertakes to polish Mr. Ickes up generally and introduce him to the county; while he, in his turn, will provide her with the luxury for which her body and soul yearn. The partnership is to cease after two years, when the lady, it is stipulated, is to receive a bonus of ten thousand pounds cash! We then see dear little Mr. Ickes floundering among Genda’s friends, who include a predatory duchess, an actress with lurid vocabulary, and a young man who waves a green handkerchief and calls him dear. Sadly disillusioned, he says that getting into society is "like entering Heaven and finding the angels all playing tiddly-winks.” In the end he is reduced, in order to cheer up, to asking one his own housemaids and her mother to have tea with him. Then the Lady Genda Traverst—let us savour her glorious full name once more—leaves the house with a fat cheque in her pocket, and we gather that she going, some moans, to make possible for Mr. Iches to marry the young person from below-stairs. We suggest that this play should have been produced either as a rollicking farce, or else a full-blooded melodrama with the aristocratic charmer sinuous and malignant Marie Corelli villainess. 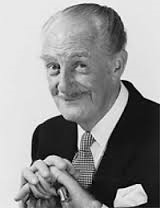 As it was Mr. Ernest Thesiger produced the play in the key of polite comedy drama, and carried Miss Pamela Corine, as Lady Gendt with him. On the other hand, Mr. Ernest Jay, the parvenu, suffered from no repressions ; his performance had plenty robust fun about it. 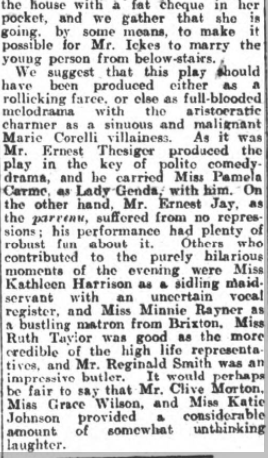 Others who contributed to the purely hilarious moments of the evening were Miss Kathleen Harrison as a sidling maidservant with an uncertain vocal register, and Miss Minnie Raynor as a bustling matron from Brixton. Miss Ruth Taylor was good as the more credible of the high life representatives, and Mr. Reginald Smith was impressive as the butler. It would perhaps be fair to say that Mr. Olive Morton, Miss Grace Wilson, and Miss Katie Johnson provided considerable amount of somewhat unthinking laughter.